The Epic Center’s soccer program is one of the largest in Upstate New York. Teams from all over the region come to compete at our premier facility. 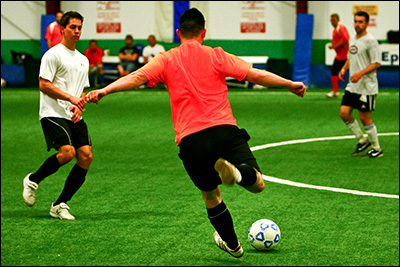 Soccer leagues at the Epic Center are for people of all ages. Players range from six years old to adults. All of our leagues provide a fun and competitive environment. Most youth and adult soccer games are played on our first open field, which is 40 yards by 70 yards. Our co-ed league plays on both Open Field #1, and also on our second open field, which is 85 feet by 185 feet, depending on our scheduling needs. Starting in January 2019, we will offer a men's Over-30 lower division on our second open field, while the upper division will continue to play on Open Field #1. During summer, only adult leagues are available. These games are played inside also. All youth players need B.W.N.Y. insurance. All youth teams must submit an official Epic Center Roster AS WELL AS an updated RosterPro. Please ask your Club President for details regarding the RosterPro. All Adult players must be registered on an official Epic Center roster. As part of our 20 Year Anniversary, if you currently have a Player Pass and are registered, you are now a LIFETIME MEMBER of Epic Center, and you'll never have to buy a Player Pass again. Youth soccer players and coaches DO NOT need to buy a Player Pass. Please print, complete, and mail our Soccer Registration Form with your payment. Additonally, please complete the Roster/Waiver. Session Information (*Sessions 4 and 5 are Adult only.) Dates below reflect session start weeks facility-wide, not neccessarily exact start dates. For the upcoming January session, the Tuesday and Wednesday men's divisions will start Tuesday 1/22/19 and Wednesday 1/9/19. Youth divisions start the weekend of 1/12/19. ^Team fee does not include ref fees. Ref fees are $15 per game. A deposit of $200.00 or payment in full must accompany the team registration form. If a team forfeits its game, it is responsible for all referee fees. $30 must be paid prior to the forfeiting team's next game. *Sign up by the registration date deadline and receive one hour free venue rentals. Must be used by the end of the session. Unfortunately, we are unable to offer a free pracice for the January session. In general, the main day of league play is bolded above. Other days serve as "spillover" days on which one or more league games are scheduled to accomodate an influx of teams, the need to finish the league on time, or scheduling requests from team captains. There will be no games 12-24-18 through 1-1-19. Epic Center reserves the right to schedule games on days other than the listed "proposed days." These will be scheduled late in the session and will be reasonable times based on your age group. Rescheduling must be done within the first two weeks of the session. The team requesting a reschule will receive availability options from Epic Center Management as scheduling allows. The two teams are responsible for agreeing where the game will be rescheduled and will contact Epic Center. Epic Center makes absolutely NO guarantee that games requested to be rescheduled will actually be rescheduled. We encourage coaches and captains to accurately fill out the scheduling request portion when registering, to cut down on last-minute cancellations and inconveniences for the other teams in the league. Please be mindful of why games really need to be rescheduled and review our registration form to see our restrictions. Any rescheduling done after the second week must be approved by the owner and a $20.00 administration fee must be paid. As of the 2018/2019 season, all reschedules must be emailed to Epic Center.